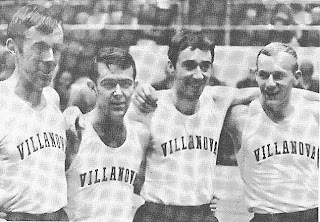 On February 17, 1968 Ian Hamilton, Charlie Messenger, Frank Murphy, and Dave Patrick set an indoor world record in the 2-mile relay at the Mason Dixon Games at the Fairgrounds in Louisville, Kentucky. Their time was 7:23.8. Thirty-five years and five days later on that same track future Villanova all-american Bobby Curtis ran the USA #3 prep 3000 meter time for 2003, 8:38.